Strong performance came as a shock to investors in these companies. Find out why. Coca-Cola stock didn't do all that well this year, but one of its key bottlers saw its shares double. Image source: Coca-Cola Bottling Co. Consolidated. Most investors dream of seeing a stock they own double in a single year. In 2015, several dozen stocks are on pace to finish with gains of 100% or more. Many of those are highflying small companies in niche areas like biotechnology where business success has sent stock prices soaring. But for some stocks, this year's performance was more shocking, with even well-established mature businesses seeing huge gains. 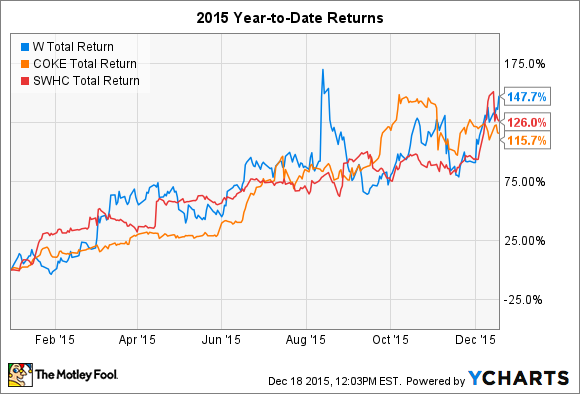 Let's look at three surprise stock doubles for 2015. Wayfair is far from a household name, but the young company has grown quickly in its brief history. The Boston-based company specializes in online retail, with an emphasis on furniture, housewares, and other home furnishings. Wayfair's role is to create a marketplace that essentially links its partner manufacturers to consumers, with the company operating not only its namesake website but also sites including AllModern.com, DwellStudio.com, JossAndMain.com, and BirchLane.com. Gun-maker Smith & Wesson has endured its share of ups and downs in recent years in line with the movements in popular opinion on firearms. In the past, Smith & Wesson had warned that booming sales from fears about tighter gun-control laws weren't sustainable, and that led to relatively poor performance for the stock in 2014. This year, though, Smith & Wesson has had success in two primary areas. First, it has been able to adapt to what CEO James Debney called "a normalizing firearm market following an earlier consumer surge in firearm purchases," making efforts to retain and build market share and sustain its reputation among gun owners and would-be buyers. Demand for both firearms and accessories was strong, with Smith & Wesson's buyout of Battenfeld Technologies in late 2014 paying off in the accessories arena. The worldwide beverage business is massive, and Coca-Cola plays a key role in the global industry. Over time, the beverage giant has gone through periods in which it sought to internalize bottling operations into a vertically integrated unit, but more recently, Coca-Cola has moved to return control of bottling operations to companies like Coca-Cola Bottling, which is the largest independent Coca-Cola bottler in the U.S. market. It's rare for stocks to double, and rarer still for companies in established business areas like furniture, firearms, and bottling to post huge gains. Nevertheless, investors in these three stocks have something extra to celebrate for the holidays this year. This Metric Suggests You're Right to Own Coca-Cola Bottling.